The TurboC library for porting Borland Turbo C 2.x programs to GNU gcc. Borland's "museum" website, if you want to download a free copy of Turbo C 2.01. The Free Software Foundation, for the GNU General Public License (GPL). Project Gutenberg, for free etexts. My other Project Gutenberg related software, GutenMark. Artist Lynn Rothan's website. 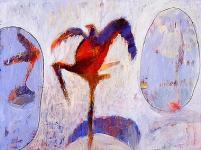 Lynn Rothan painted the confused birdman in our graphic image at the top of this page. ©2002 Ronald S. Burkey. Last updated 04/20/02 by RSB. Contact me.